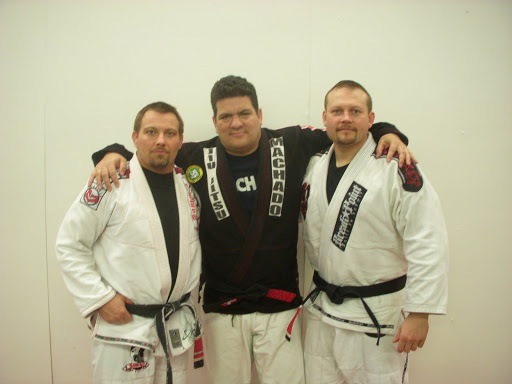 Rigan Machado 1st Degree Black Belt Chris McCune (McCune's Martial Arts), Rigan Machado himself and the newest black belt to the family, Mike Ellefson (Midwest Center for Movement). Mike was presented his black belt by Chris McCune, under the supervision of Rigan Machado, at a Rigan Machado seminar that took place at McCune's Martial Arts in Brooklyn Park, Mn, on 04/23/11. Mike Ellefson is the Chief Instructor of the Midwest Center for Movement and Aikido Bukou Dojos. In 1998, Mike began studying Brazilian Jiu-jitsu in Rickson Gracie's organization. Mike is a 4th degree black belt in Aikido, a 2nd degree black belt in Ryukyu Kempo, Blue Belt (right before black in that system) Assistant Instructorship in MMA under Rickson Gracie Blackbelt, Dave Arnebeck, and holds rank in Judo, and Shotokan Karate. In addition, Mike has trained with some of the most reknowned and decorated grapplers in BJJ history including Rigan Machado, Rickson Gracie, Xande Ribiero, Comprido Medeiros, Luiz Claudio and Luiz Palhares. Mike is a dedicated student, teacher and friend. The BJJ world has just gotten a little stronger today.